Driving around giving people rides to where they need to go is just one example of the type of flexible employment opportunities generated by our ever-evolving service-based economy. For progressive policymakers and economists though, this is just not good enough. With 7.8 million people out of work, new opportunities to get Americans working should be celebrated, but unless it pays the arbitrary $15 an hour “living wage” in vogue today, the naysayers won’t be quelled. Robert Reich, former U.S. Labor Secretary for President Bill Clinton, for example, is using new data about the net income Uber drivers earn as evidence that more needs to be done to crack down on the on-demand economy. In June, Buzzfeed released findings from analysis of Uber’s data on rides in three cities (Denver, Detroit, and Houston). Overall, it found that after costs were taken out, drivers in those three markets earned less than an average of $13.25 per hour. In Denver for example, drivers earned approximately $13.17 per hour, while they earned $10.75 per hour after expenses in Houston and $8.77 per hour in the Detroit market. The costs incurred which include gas, insurance, maintenance, and depreciation costs could account for 20-30 percent of earnings. Some drivers interview by Buzzfeed underscored their disappointment about the costs they incur eating into their income, but there’s more to the story. Driving for Uber and Lyft, or participating in other sharing economy opportunities is contract work, not traditional wage positions. While the schedule is not predictable, the flexibility they enjoy provides a level of freedom that workers in traditional jobs forgo. Drivers are in similar positions to entrepreneurs who aren’t guaranteed a steady paycheck, have to hustle for work, and incur costs, but at least those are costs that they can claim as business expenses on their taxes. In addition, not every driver is trying to earn a living, but some are supplementing their income similar to a second job. We can’t dispute that wages have been flat or at best growing about 2 percent annualized. That’s an indictment of the Obama recovery and the policies of this Administration, but not pay increases for American workers. However, Reich seems stuck with an outdated view of what a “good job” should be. Just because older generations are accustomed to work arrangements being punch-in, punch-out with a check in hand on Friday, it doesn’t mean that this is what Millennials or women want. That may have been how things were done under the Ford, Carter, and Clinton Administrations under which he worked, but the economy has evolved. Both young people and women are willing to sacrifice money for flexibility in their schedule and work environments. The sharing economy lends itself well to that kind of arrangement. In this scenario who guarantees this new form of insurance? If private companies, that could be an attractive incentive. If the government, then taxpayers are on the hook for another costly program that would have no limit on participation. How do you decide which contractors get to benefit? How do you determine what contractors should be earning if their wages are variable to begin with and how do you determine when the loss of revenue is due to the contractor working less because they went on vacation versus economic conditions beyond their control? 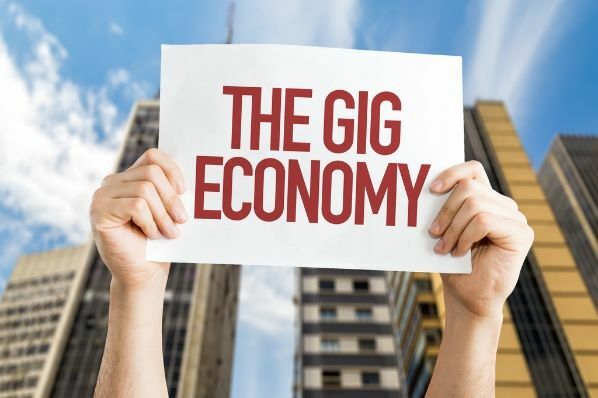 Instead of finding ways to tear down the on-demand economy, policymakers ought to look for ways to expand it to create opportunities for all who need it such the nearly 8 million workers still out of work who would probably rather have an opportunity than none at all.